After a long, loud and rainy night filled with thunderstorms, Sarah and I were on the road north through Indiana to our next campground and amusement park. We turned off of Interstate 65 onto Indiana Route 43 and continued north. It was wide-open flat land covered almost entirely with farms and an occasional grove of trees. Off in the distance to our west was a very impressive sight. 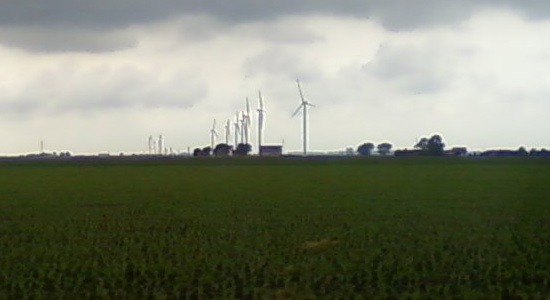 Rising above the horizon was approximately ten wind turbines of a wind farm under construction. None of the rotor blades were moving. It was a beautiful sight to see and I was so impressed with the height of the structures. I look forward to the day when large-scale wind farms are commonplace.